Balistes vetulaThese colorful, oval-shaped fish are popular aquarium attractions. They can dart into crevasses when threatened, and lock their dorsal fin in place to prevent predators from pulling them out. They also can produce an audible warning from special membranes, warning other fish to keep away. Although this fish is often caught for food, caution should be used during breeding season because they are aggressively defensive of their territory and can inflict a strong bite. English language common names for this fish are queen triggerfish, ol’wife, old wife, triggerfish, and turbot. Other common names include baliste royal (French), bourse (French), bousse (French), bousse mazarin (French), cachúa (Spanish), cachuda (Spanish), cangul (Portuguese), cangulo (Portuguese), cangula papo-amarelo (Portuguese), cangulo-do-alto (Portuguese), cangulo-fernande (Portuguese), cangulo-pintado (Portuguese), cangulo-real (Portuguese), cangulo-rei (Portuguese), cangulo-verdadeiro (Portuguese), cangurro (Portuguese), capado (Portuguese), cochino (Spanish), fambil (Portuguese), gatilho-rainha (Portuguese), kärringfisk (Swedish), keshomongara (Japanese), pakol (Davawenyo), pakoy (Tagalog), papakol (Tagalog), peixe porco (Portuguese), peixe-gatilho (Portuguese), peixe-porco (Portuguese), peje puerco (Spanish), pejepuerco (Spanish), pejepuerco cachuo (Spanish), peroá (Portuguese), pez puerco (Spanish), piruá (Portuguese), pishiporko rab ‘i gai (Papiamento), puerco (Spanish), rogatnica piekna (Polish), rotzahntriggerfisch (German), sol (Spanish), and yotojoro (Wayuu). Occasionally caught as a gamefish and a commercially important species, the triggerfish is an excellent fish for human consumption. In an article from 1917, it is described as being skinned and eaten stewed in Bermuda with the skin utilized for scrubbing. In small villages of Brazil, parts of this fish are used in traditional medicine in the treatment of asthma, earaches, and stroke victims.This species is often maintained in public aquarium facilities however it is a poor choice for a community aquarium due to its large size and aggressiveness. When divers approach the queen triggerfish, it is generally a shy species and moves away if followed. Caution should be taken when approaching this fish during breeding season while they are aggressively defending their nests as they inflict a nasty bite. The status of the queen triggerfish is not well-documented, however it is a commercially important food fish and is vulnerable to trapping and spearfishing. It is currently listed as “Vulnerable” with the World Conservation Union (IUCN). > Check the status of the queen triggerfish at the IUCN website. The queen triggerfish is found in the eastern Atlantic Ocean from Ascension, Cape Verde, and Azores, ranging south to southern Angola. 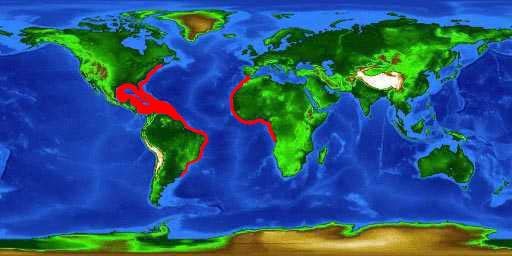 In the western Atlantic, it resides in waters from Canada to Massachusetts and the northern Gulf of Mexico to southeastern Brazil. 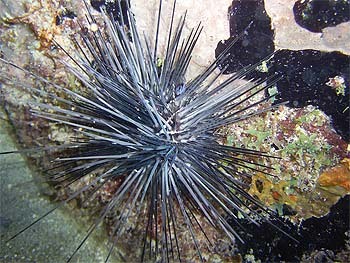 This species is found over rocky bottoms and often associated with reefs. It forms schools but may also be observed solitary over sandy and grassy habitats. 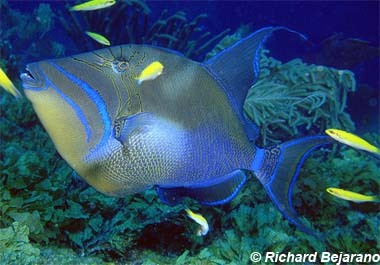 The queen triggerfish lives at depths from 7-902 feet (2-275 m), however it is more commonly seen at 10-98 feet (3-30 m). The queen triggerfish is a large oval-shaped, laterally-compressed fish with small eyes located toward the top of the head. The anterior dorsal fin possesses two spines used to lock the fish into a crevice during the night. The first one locks and the second spine unlocks. This prevents predators from pulling them free or swallowing the fish and is responsible for the common name, “triggerfish”. In addition, queen triggerfish have special membranes located just posterior to the pectoral fins which are used to produce a throbbing sound that is audible to most other fish as a warning to stay away. The posterior dorsal fin is large and triangular while the caudal fin is crescent-shaped. The upper and lower rays of the caudal fin exist as long trailing filaments. It is capable of moving its eyes independent of each other. The sexes have similar morphology and coloration while juveniles often have shorter fins and are paler in color than the adults. 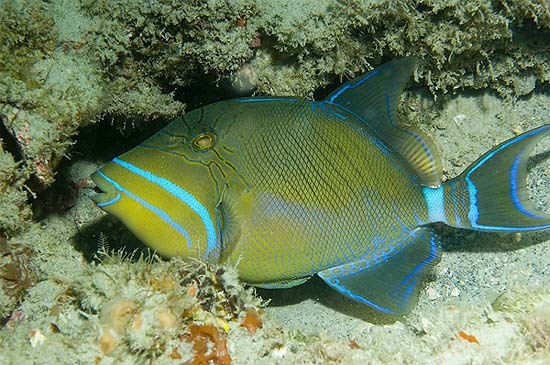 Queen triggerfish have distinctive coloration of greenish to bluish gray along the back, orange-yellow on the lower portion of the head and abdomen, with two wide diagonal curved bright blue bands extending from the snout to below and in front of the pectoral fins. The lower band is continuous with a blue ring around the lips. There is also a broad blue bar across the caudal peduncle and blue sub-marginal bands in median fins. The mouth is small with strong jaws that contain strong incisor-like specialized teeth used to chisel holes of hard-shelled prey items. Reaching a maximum total length of 23.6 inches (60.0 cm), the queen triggerfish is more commonly reported at total lengths of approximately 11.8 inches (30.0 cm). The maximum reported published weight of this species is 12 pounds (5.44 kg). Queen triggerfish reach maturity at 9-11 inches (23-27 cm) fork length and have a lifespan of at least 7 years and possibly up to 13 years. Feeding primarily on benthic invertebrates, the queen triggerfish preys on sea urchins by creating water currents that overturns the urchin, making it vulnerable to predation by exposing the underside where the spines are short. It also feeds on macroalgae, bivalves, crabs, starfish, sea cucumbers, shrimp, and polychaetes. Feeding occurs during daylight hours. At night, they wedge themselves into crevices within the reef for protection from predation. 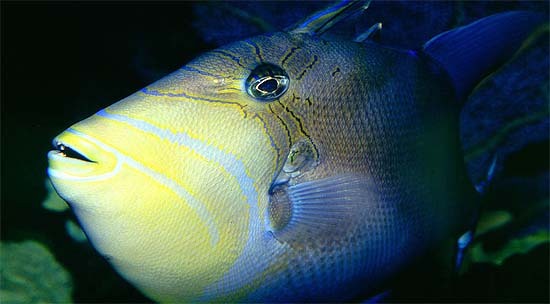 Male queen triggerfish establish territories of approximately 33 feet (10 m) in diameter, attracting several females. Nests are built in the sand by moving fins rapidly or creating a current by blowing water with the mouth near the bottom to create sand bowls. The eggs are released into these bowls after a courtship ritual of which little is known. The mating pair fiercely defends the nest of fertilized eggs, even biting divers that approach too close. When the eggs hatch, the young disperse into the water currents. Reproduction occurs year-round, peaking in the fall and again in the winter. Predators of the queen triggerfish are larger reef fish including grouper, jacks, and sharks. Occasional reef visitors such as tuna and marlin may also feed on this large aggressive fish. 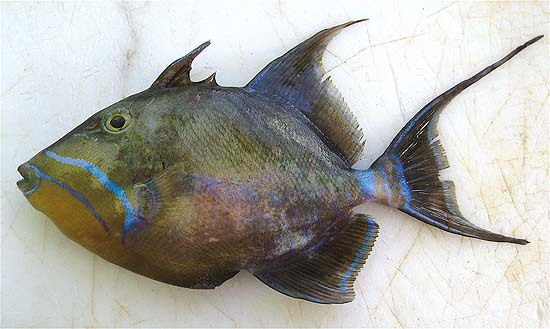 The queen triggerfish is parasitized by numerous organisms including cestodes, the copepod Taeniacanthus ballistae and the nematodes Cucullanellus travassosi and Contracaecum sp. The queen triggerfish was originally described as Balistes vetula by Linnaeus in 1758. Synonyms referring to this species in past scientific literature include Balistes bellum Walbaum 1792, Balistes equestris Gronow 1854, and Balistes vetula trinitatus Nichols & Murphy 1914.